A woman and children wait as UNICEF-supported emergency humanitarian supplies are distributed in Hudaydah, Yemen, in June 2018. “Attacks against civilian facilities and services are unacceptable, inhumane and in breach of the basic laws of war,” said UNICEF Executive Director Henrietta Fore. “Yet the past few days have seen an escalation in the targeting of systems and facilities that are essential to sustaining the lives of children and families,” she added. On Saturday, a UNICEF-supported sanitation centre in the Zabid District came under attack, damaging the facility’s fuel tank. A day earlier, the al-Mina District water station ­was hit, which is the main source of water for the key port city­. Overall, 22 million people need some kind of assistance in Yemen after years of grinding conflict between government and Saudi-led coalition forces, who’ve been battling Houthi rebels for control of the country. Hudaydah is the main port for the shattered import-dependent economy, as more than 70 per cent of all humanitarian supplies, commercial goods and food brought into the country, passes through the docks there. UNICEF-supported emergency humanitarian supplies are distributed in Hudaydah in June 2018. 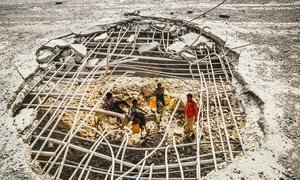 The UN Humanitarian Coordinator for Yemen, Lise Grande, on Sunday described Hudaydah as just “one airstrike away from an unstoppable epidemic” due to the looming risk of a fresh outbreak of deadly water-borne cholera. Ms. Fore again called on everyone involved in fighting to protect civilians and civilian infrastructure. “The war in Yemen has no winners. It is robbing Yemeni children of their futures,” she concluded.